• Expanded facility to 50,000 sq. ft.
• Expanded the facility to 100,000 sq. ft.
With combined strengths of a technologically oriented manufacturer, superior sales and service organization and a sophisticated global distribution network, US Motor Works is a company on the move in the automotive marketplace. With the focus of providing Automotive and Heavy-Duty engine parts and components, US Motor Works is constantly looking for ways to support its customers by increasing the availability of quality parts and components. Currently, US Motor Works manufactures a complete line of Water pumps and Fan Clutches. Precision Engineering and manufacturing are essential in creating products that you can depend on. At US Motor Works, quality begins with skilled technicians utilizing materials that meet or exceed OEM specifications to manufacture premium water pumps and fan clutches. Our specially trained technicians apply stringent quality control standards utilizing sophisticated technology to make sure that all US Motor Works products meet the rigorous demands of our customers. When you buy US Motor Works manufactured items, you are investing in technology that has been meticulously engineered, manufactured from the highest quality materials and thoroughly tested to assure accuracy, reliability, and workmanship. With more than 50 years of combined experience, this powerful company is committed to providing an extensive line of high-quality products, the finest customer service and the best support program available in the automotive and heavy-duty market. With our 6 simple steps in new product development process, US Motor Works sits in the driver’s seat when it comes to quick and precise product development. From product definition to design, production planning and preparations, prototype production and final production run, it’s a mere 120 days or less. US Motor Work’s OPEX mentality enables us to be on the leading edge of product development. US Motor Works utilizes proprietary Electronic Information Technology as a communication and information platform for new product releases, bulletins, technical updates and general client correspondence. USMW E.I.T. is internet based with 24/7 365 days a year access to keep our clients up to date in the most efficient and expedient format possible. As part of our E.I.T. Platform we have also added the Fuel Pump U and Water Pump U websites. These websites are quickly becoming the educational source for fuel pumps and water pumps. Each site features a vast collection of education, tech tips and product releases. The websites are an important tool for techs and consumers. US Motor Works has created an engineering and technical environment from the design process to the final production product. Starting with CAD/CAM 3-D projections, computerized testing, a complete manufacturing plan and ending with a reliable distribution network. US Motor Works is able to track and control all related design, quality processes and packaging with specifications and manufacturing excellence in mind. Our State-of-the-art manufacturing utilizes our four principles; Supply Chain (improved flow), Quality Management (robust quality assurance), Production (pull & flow and 5S) and Measurements by KPI’s (Key performance indicators). 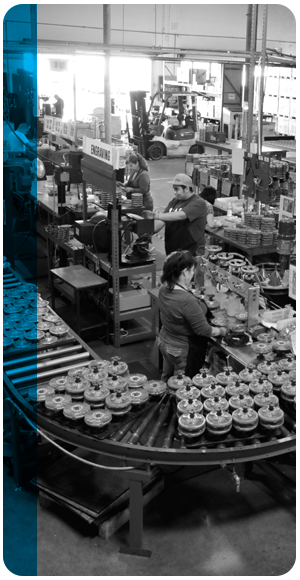 With these manufacturing principles and our continuous improvement ideology under the OPEX umbrella, US Motor Works continues to be the front-runner among the industry leaders. Our In-house marketing and graphic design department helps to ensure our branding is at the forefront of the automotive industry. Working closely with category managers allows us to create powerful advertisement campaigns, marketing sales tools and educational pieces. Along with the printed media, our team also works on a digital platform via brand specific websites and social media. Through social media we are able to connect with the end users and get genuine testimony of our products, thus making each brand recognizable and a name they can trust. US Motor works, LLC and its employees are committed to providing an extensive line of consistent High-Quality Products, the finest Customer Service, and Satisfaction, through our commitment to the continual improvement of our Quality Management System of ISO 9001:2015. US Motor Works adoption of OPEX is a business philosophy aimed to achieve a sustainable competitive advantage. Operational Excellence focuses on the customer’s needs. By leadership, teamwork, and problem-solving principles, US Motor Works achieves continuous improvement, empowered employees, optimized activities, and processes. Lean Manufacturing is the foundation of the Operational Excellence implementation program to create maximum value for your customers. It builds an integrated product delivery process to meet the changing needs of customers while creating a fundamental and sustainable change in organizational culture. US Motor Works, LLC and its employees are committed to providing an extensive line of consistent High Quality Products and the finest Customer Service and Satisfaction, through our commitment to the continual improvement of our Quality Management System of ISO 9001:2015.